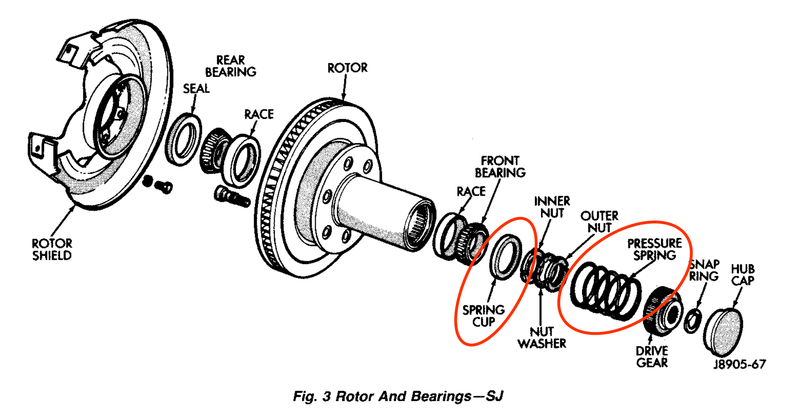 I am looking for the spring cup and pressure spring that goes inside the spindle on the front hub. Dana 44 on a 1990 Grand Wagoneer. I am doing the brakes and wheel bearings and for some reason these are missing from the assemblies. I will need a pair of them. Also, if anyone has some rotor shields that are not all rusted up that would be great! these should work as a replacement for your dust shields/ caliper brackets. I would even reach out to them on the phone about the springs. It's a Dana 44 axle, as you know, they went under everything during this period. Thanks Fleet Fox I will give them a try. Ordered the caliper brackets from broncograveyard and found the springs and cups on ebay.